Surveillance cameras are expected to work outdoors, ranging from deserts to monsoons to blizards. Ensuring that cameras works reliably in these extreme conditions is critical and takes more than the normal indoor camera provides. In this tutorial, we examine the effects of climate, how to tell if a camera will work in your conditions and when you should use extended temperature range cameras, heaters, blowers and sunshields. Housing type depends on the location's average temperature and humidity. High or low temperatures will cause components to fail or freeze. Prolonged exposure to even moderately high temperatures will reduce the lifespan of equipment, as well. Humidity may cause component damage but may also cause condensation on the inside of dome lenses in warmer months, and frost in cooler months. Exact operating condition specifications are found on camera specification sheets, with temperature being more common than humidity. Though some variation from manufacturer to manufacturer exists, 32º F/0º C is commonly the low point and ~120º F/50º C is the high point. Humidity is less often specified, but is most often in the 20-80% range, give or take 5-10%. Note: the specific ranges vary by model for each manufacturer. The numbers listed are just for illustration purposes. Given these typical specifications, in warm, dry, climates, heaters and blowers may be unnecessary, since temperatures remain within acceptable operation ranges of the camera the vast majority of the time. In colder climates, where temperatures fall below freezing, heaters/blowers are highly recommended. In hot climates, or when cameras are installed in high-temperature industrial areas, housings with more powerful cooling systems may be required. These options are covered in more detail below. Some manufacturers, including Stardot and Moxa, claim much wider temperature ranges for their cameras, potentially eliminating the need for heaters or blowers. The StarDot NetCam SC series, for example, available in both dome and box models, is rated to temperatures of -40º F/C without using a heater, while Moxa's 36-1MP features a temperature range of -40º F/C to 167º F/75º C.
These temperature ranges may mislead users into installing these box cameras without housings. However, these cameras are not outdoor-rated, so must be installed in a housing if outdoors. Additionally, temperature is only part of the problem in extreme locations, so frost and condensation may still be issues. 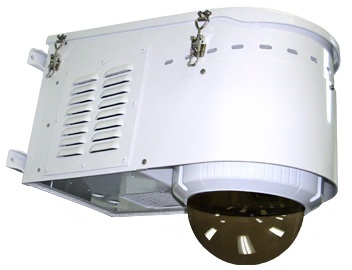 Cameras such as these are therefore more suited for indoor locations with wide temperature ranges, such as freezers or high-temperature industrial facilities. Heaters are the main means of managing lower temperatures in camera housings. These usually consist of a heating element beneath the camera or surrounding the dome window, but some housings intended for extreme low temperatures use multiple elements, lining the interior of the housing. Heaters generally add $30-40 to the cost of a housing. 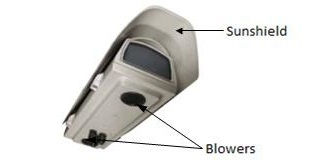 The sunshield, a supplemental guard which is mounted to the top of the camera housing, leaves an air gap between the shield and the housing itself. This air gap allows heat to radiate from the top of the housing, and also acts as a buffer, removing heat radiating from the sunshield. Many sunshields also extend further than the top of the camera housing itself, which can shield the camera lens from damaging direct sunlight in some cases. Sunshields are the simplest means of protection from heat, and also least expensive, typically $20 and under for standard housings. For more on extreme temperatures, review our integrator survey results on outdoor camera tempearture impact.